The Lapp Cable logistics centres with their highly-motivated employees ensure that your order reaches you as quickly as possible. The modern logistics centres in Stuttgart, Freiberg and Hanover offer a smooth and fast 48-hour delivery service. This applies not only to Germany, but also to European conurbations in Benelux, Great Britain, France, Italy, Austria and Switzerland. 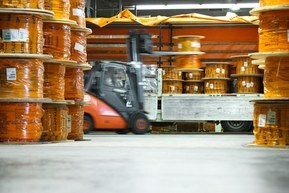 We handle over 750,000 consignments every year in Stuttgart alone. Our new, additional service feature makes delivery even clearer for you: Simply give us your email address and request a delivery update every evening. You will receive full details of the completed dispatch including details on the delivery and mode of delivery plus the corresponding parcel or consignment number. Orders for cables and leads (cutting lengths) that reach us by 12.30 pm will normally be delivered on the next but one working day (subject to product availability). You will receive cutting lengths that are ordered after 12.30 pm a day later. You will generally receive orders for cables and leads (original lengths), connectors, cable accessories etc. that are received by us by 3.30 pm on the next but one working day. We will deliver orders received after 3.30 pm one day later. We will naturally be able to fulfil your requirements regarding individual logistics services such as express deliveries within 24 hours, early deliveries, Saturday deliveries, special deliveries or airfreight. Find fast and easy the correct cable gland for your application.